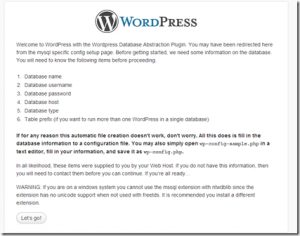 The maximum size of the Wordpress database is 20MB. The MySQL database is provided by ClearDB, not Microsoft. In order to raise the limit, one must purchase a plan (starting from $9.99/mo) through ClearDB. 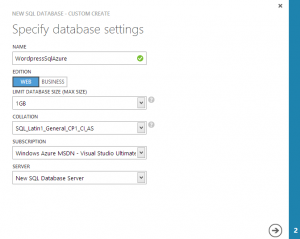 Fortunately, it’s possible to skip the MySQL altogether and to run Wordpress with SQL Azure. Officially Wordpress supports only MySQL. But it has a rich set of different plugins and one of those plugins is WP Db Abstraction. 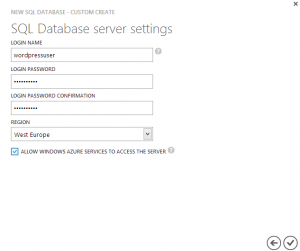 The plugin makes it possible to run the site using a different database platform, in this case SQL Azure. On the Microsoft forums a forum member mouradl provided instructions on how to install and use the plugin. 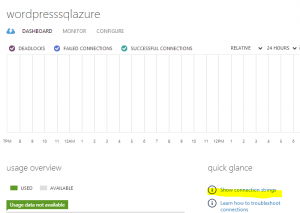 I took those instructions and built a GitHub repository which make the process of deploying a Wordpress with SQL Azure a little easier. 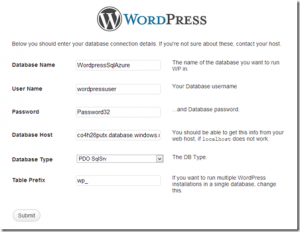 The following tutorial shows how to run the Wordpress using SQL Azure and Azure Web Sites. At this point we have the empty Web site and the empty database ready. Next step is to add the Wordpress site into our web server. First, using the Azure Management Portal, enable the Git publishing for our newly created site. The required function is “Set up Git publishing”. 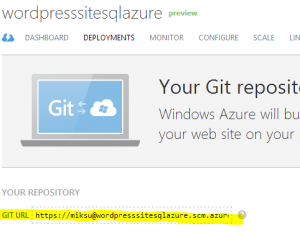 The next part is little tricky as we have to first clone the Wordpress-SQL-Azure repository from GitHub and then deploy it to the Azure. Now we have the required files on Azure. 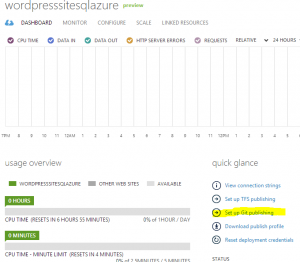 Only thing left is to configure our Wordpress installation to work with the SQL Azure database. Now everything is ready and the install wizard will automatically continue from the Wordpress’ default installation. Give the site a name, enter a password and email and you’re all set! 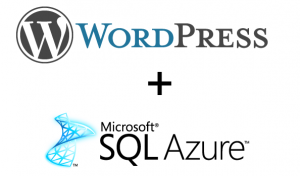 Most of the Wordpress plugins should work with SQL Azure but there are some which override the db.phpfile from wp-content –folder. This happens for example with the W3 Total Cache plugin. The easiest solution is to avoid these plugins (for example WP Super Cache works without modifications) but if the db.php gets replaces by some plugin, the fix is to use a FTP Client and to upload the db.php from wordpress-sql-azure repository to the site’s wp-content –folder.